Safety Equipment has never been such an important topic as it is today, and the importance/emphasis grows each racing season. Therefore, is important to understand what safety products are now available, and how they affect the driver&apos;s safety. Each manufacturer has their own recommended sizing and usage charts, as equipment fitment varies from manufacturer-to-manufacturer. Below who will find sizing/fitment guides to help you choose the proper Racing Seat. If you need other driver safety gear, please visit our other tech pages for Racing Helmets, Racing Suits, Driving Gloves, Driving Shoes, and also Head-Neck Restraints. And always remember, if you have a question about choosing the proper safety equipment, please contact our knowledgeable technical sales staff for assistance. KNOW THE FACTS - A racing seat is an extremely important safety item regardless if you are racing circle track, road racing, drag racing, drifting or participating in any other type of motorsports today. The racing seat must support the driver’s full body and permit sitting within the vehicle’s confined space with as little fatigue as possible. It&apos;s probably the most important part beside the roll cage and the helmet. It&apos;s basically a cocoon for a driver&apos;s safety. While driver comfort is a factor, most racing seats are fixed back design with accommodations for 5- or 6-point harnesses. There are different designs on the market to provide the support body you want and where you need it. In the United States, although there are several high-quality racing seat manufacturers who have been around for decades, racing seats products themselves for the most part, have been unregulated regarding safety standards. However, it is only fair and important to note that several of these seat manufacturers took it upon themselves to adopt the International Motorsports (FIA) FIA8555-1999 safety standard. For more information, please vist the FIA website at www.fia.com/safety-equipment (link opens new window). The good news is that safety certification requirements for racing seats are changing RAPIDLY in the the USA motorsports marketplace and several well-known sanctioning bodies are now requiring that all participant&apos;s racing seats meet the SFI® 39.1 and SFI® 39.2 Certification Specifications. As of late 2018, all NASCAR professional divisions, along with the Lucas Oil® Late Model Dirt Series and World of Outlaws Craftsman® Late Model Series, are now requiring that all seats used in competition meet these SFI® Certification Specs. Racecar Engineering™ has spoken to many of seat manufacturers while compiling and writing this technical section, and ALL racing seat companies have said that MORE changes on on the way... Very soon! So be sure to read your rule book closely because SFI® Certified seats being a requirement at all levels of sportsman racing is just a matter of due time. PROPER FITMENT - Having a racing seat that fits properly is crucial to the driver&apos;s safety. The GENERAL RULE when sizing a racing seat is to MEASURE YOUR HIPS while in an upright natural position while sitting on a HARD table-top surface just on front of the groin area. Each brand fitment page below contains as an illustration of this measuring process. The person being measured can wear normal street clothes during this process, as a racing suit will just add to the snug fit needed for both driver comfort and safety. Most STANDARD &apos;Off-The-Shelf&apos; racing seats will probably fit a normal size driver perfectly. 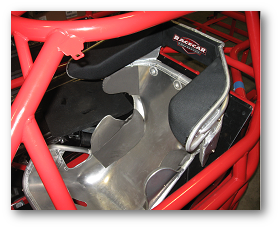 The racing seat manufacturers that Racecar Engineering™ represents have built thousands of seats over the years and have optimized their production dimensions to fit almost every type of body. EXTREMELY IMPORTANT!!! All measurements MUST be taken in ABSOLUTE straight lines. Please use a yard stick or ideally, a tire stagger gauge. If you ONLY have a tape measure, DO NOT let it bend or follow the curves of the body in any way, as proper seat sizing & fitment will be compromised. Once you have that measurement, you can then choose a seat from any of the manufacturers listed below by viewing their seat sizing, style and fitment page. On each page, we list each of the manufacturer&apos;s seat types and production sizes available, as they directly apply, to each different type of race cars and racing series. A NOTE ABOUT SEAT TYPES AND STYLES - Choosing a racing seat can be REALLY confusing, as it is very common for SEVERAL different types of seat styles from a manufacturer, to be available for use in one type of race car type (i.e. : Sprint Cars, Late-Models, Drag Cars, etc.). It is up to the driver, crew chief or car owner, to sort through all of the features and benefits of each applicable seat style in order to finalize final preferred seat choice. Many times, your chassis builders will have a preferred seat brand and style that they recommendation for their race cars, so please check with them if they are available to consult. Finally, it you or your team cannot figure-out which racing seat would work the best for you, please contact one of our Technical Sales Associates and they will work with you (and also the factory is needed) to determine the best racing seat style for your type of racing. REPLACING A RACING SEAT? - If you are replacing a racing seat you already have, please don’t make the mistake of assuming the sizes are all the same from one manufacturer to the next. Just because you use a size 15" racing seat from Brand X, that doesn’t mean that Brand Y’s size 15" racing seat with provide you the same fit. Again, while most &apos;Off-The-Shelf&apos; production racing seats are normally fitted using the &apos;Seated-Hip&apos; measurement, please always check with one of our Technical Sales Associates for their expert recommendation or contact the factory to ensure proper seat fitment. CUSTOM RACING SEATS - Need a &apos;Custom Racing Seat&apos; made for you? We have also provided downloadable PDF links to Factory Custom Racing Seat Order Forms for all brands below that do offer &apos;Custom-Made&apos; racing seat manufacturing services. Gift Cards - No Hidden Fees. 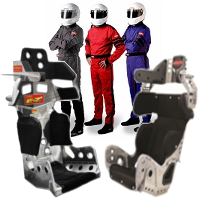 Racecar Engineering™ has NOT forgotten about your racing seating needs. However, many of these unique types of racing segments fall into a VERY specialized seating fitment category are much too detailed to address here in our Tech Center website section. Your racing segment requires specialty seats which depends on your specific motorsports category, along with specialiized types of mounting brackets and hardware based upon your OE chassis platform. For these applications, we have available to you, the world-class racing brands of both Momo®-USA and OMP™ Racing Products. If you are interested in either one of these brands to help complete the seating portion on your race vehicle build. Please contact one of our Technical Sales Associates for assistance, as once again, detailed information will be needed from you to get you EXACTLY what you need. 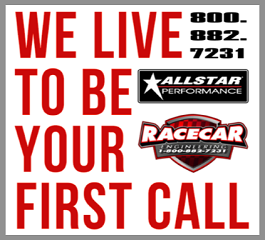 Please remember that Racecar Engineering™ carries a full assortment of brand-name racing gear. 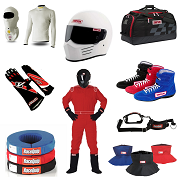 We have in stock and ready to ship, racing suits, driving gloves and shoes, underwear, hoods, socks, helmets, helmet supports, harness pads, restraints, helmet skirts, gear storage bags and much more. SEATING PRODUCTS - USAGE DISCLAIMER - No seat or any type of seat related product sold by Racecar Engineering™ should ever be used on a street car, street truck or any type of street vehicle at any time, UNLESS the manufacturer can provide the user proof (a written legal document) that states that their seat product(s) conform to the National Highway Traffic Safety Administration (NHTSA) National Traffic and Motor Vehicle Safety Act of 1966, as amended, 49 U.S.C. chapter 301 (the Vehicle Safety Act), and abide by certain other applicable laws relating to motor vehicle safety. All companies that manufacturer, produce and import these types of products must ensure that their products comply with all applicable Federal Motor Vehicle Safety Standards (FMVSS). It is the SOLE responsibility of the end-user to ensure any product that they are intending to use is fit, and legal, for their intended automotive purposes. Racecar Engineering™ will NOT be responsible, or liable, in any way due to the misuse of any type of seating products sold through Racecar Engineering™ that results in an accident, injury, death or any type of related consequential damages.